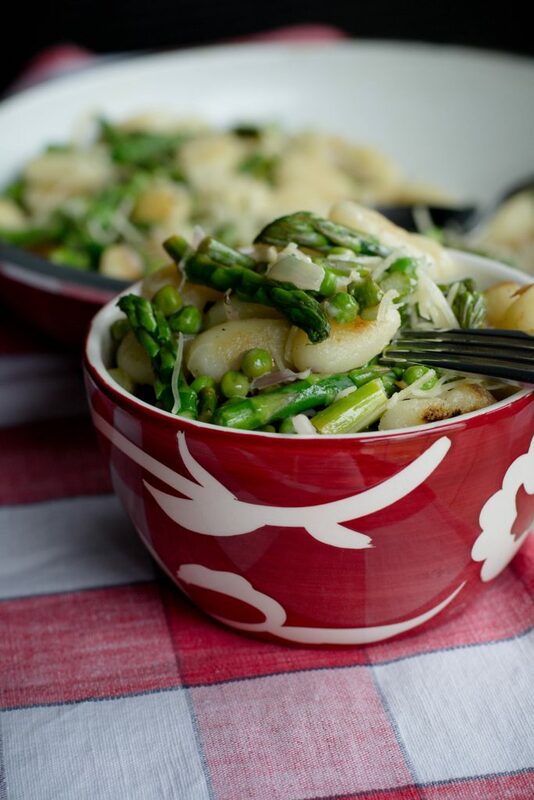 Springtime Asparagus Gnocchi - What the Forks for Dinner? Spring is in the air, although it really doesn’t quite feel like it here in Northern Illinois, so maybe a fresh springtime recipe will help. 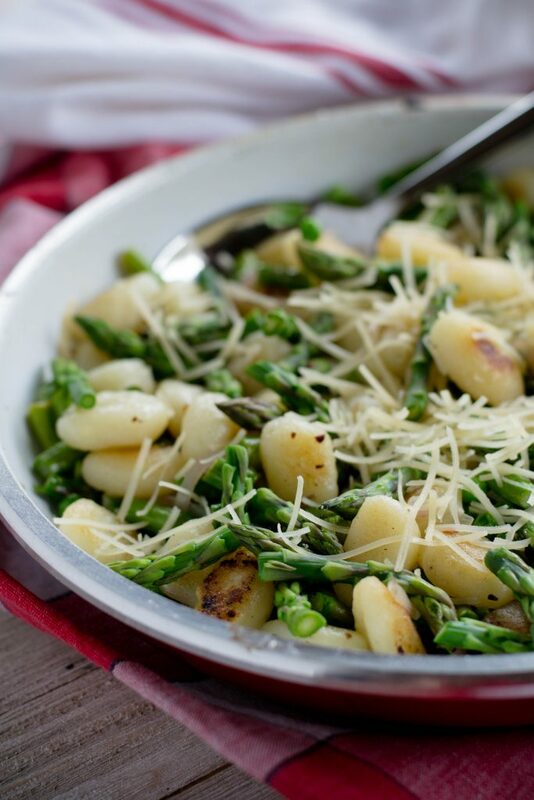 Springtime Asparagus Gnocchi. As usual I was trolling Pinterest for recipe ideas. I had a package of gnocchi in the cupboard and had a hankering to use it. I came across a recipe from delish knowledge that looked wonderful. Onward I trolled, but kept coming back to the same recipe. After a few changes……. 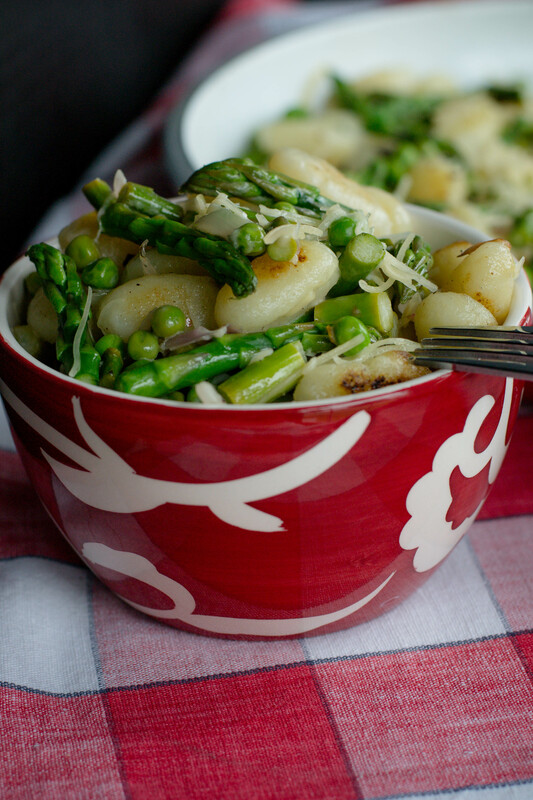 ta da……..Springtime Asparagus Gnocchi. So thank you to delish knowledge for such a wonderful inspiration. The recipe is very easy, and as we go further into Spring asparagus will be easier and easier to find. Tim and I moved and in doing so, we had to leave behind our beloved asparagus patch. If you have ever grown asparagus you know it is a labor of love, but with Farmers markets a plenty, I’m sure we will be able to find fresh asparagus very soon…..if the weather ever gets better…ugh! I am on Spring Break from school and of course, the weather is bleck! I was hoping for some outside work….our new yard is a blank canvas that is in desperate need of help. Oh well……I guess that leaves me with more time to paint….the inside needs some decor therapy as well. It also leaves me more time to cook, so keep checking for new recipes!! 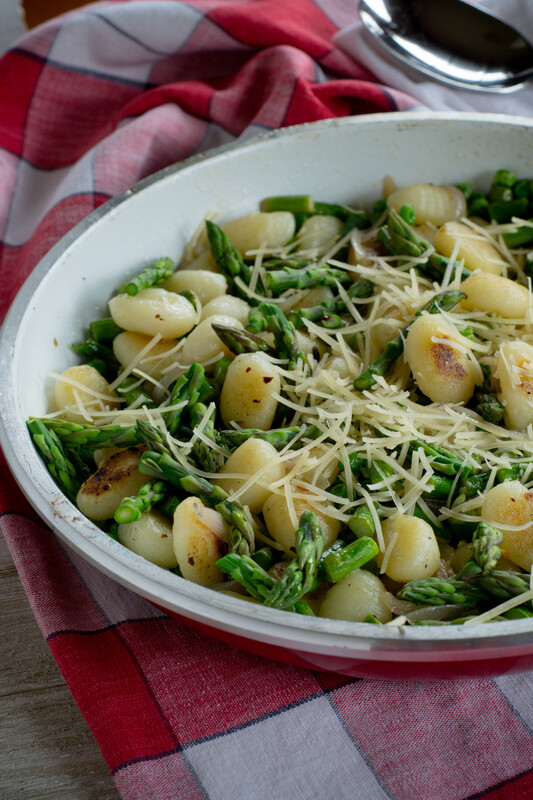 But I digress…Springtime Asparagus Gnocchi is delicious. Seems like I have been using that word a lot lately, but I have had a lot of delicious food in the past week, this recipe was one. If you’ve never had gnocchi, try it! Fluffy little pillows made from potato, flour, and egg. And no…I did not make them myself. Some things in this world are meant to be purchased or to be made by others. Labor intensive things for me, are those things…..I just want some stuff to be ready already……just saying. 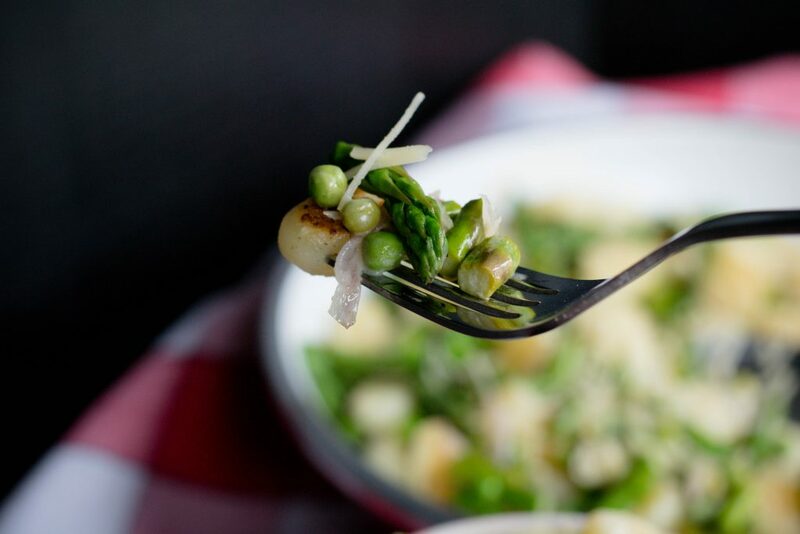 Gnocchi takes on the flavor of whatever you add it to, in this case, the fresh taste of asparagus, shallots, and peas. Screaming springtime, this dish is light, even with a touch of cream. It’s quick….gnocchi cooks in like 3 minutes, it takes longer to boil the water…….I’m enunciating with my hands….a pinch of red pepper flakes gives a background bite, but not too much, lemon juice brightens the whole thing up and a sprinkle of parmesan cheese to complete the dish! Looking for a quick easy springtime meal……Springtime Asparagus Gnocchi is that dish. Make it and enjoy! Bring a large pot of water to a boil.Salt water and add the gnocchi,cook for 3 minutes or as directed on the package. Drain and rinse gnocchi and set aside. Heat 1 tablespoon coconut oil a large skillet over medium heat. Add shallots, salt and pepper and cook for 2-3 minutes until shallots are translucent. Add the asparagus and cook for 5-6 minutes until asparagus is tender crisp. 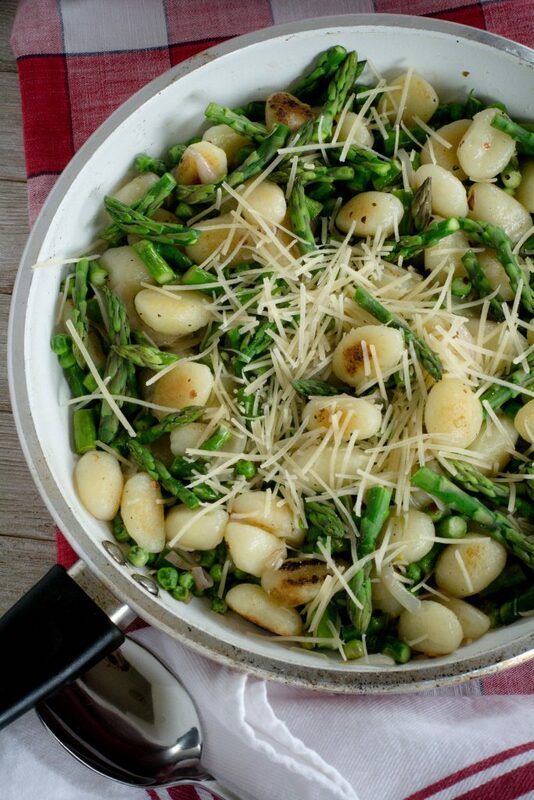 Remove asparagus mixture from skillet to a bowl and set aside. In the same skillet over medium high heat melt the remaining coconut oil and the butter. Add the cooked gnocchi, and cook until gnocchi begin to brown 4-5 minutes. Add in the asparagus mixture, the peas, red pepper flakes,lemon juice and cream to the gnocchi in the skillet and cook for another 2-3 minutes until peas are heated through.